i have an exciting nail art opportunity from China Glaze to share with you all today! i'm not affiliated with this contest in any way, just want to make you all aware of this fun opportunity :D check back tomorrow for a contest opportunity from Ardell. Happy Monday! Los Angeles (November 14, 2013) – Celebrate the season in colour with China Glaze® Nail Lacquer. The leading nail polish brand announces the How Will You Live in Colour This Holiday Season? Contest. 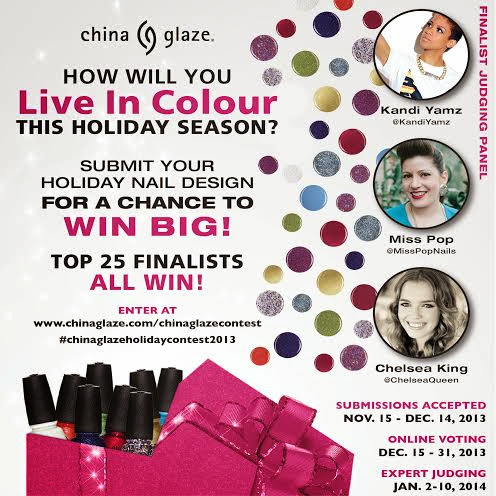 Participants enter their best holiday-themed designs to win cash prizes and China Glaze® collections. ‘Tis the season to top those tips in glitz, glam and festive flare. Go with the classic, throw in a twist-on-traditional or create a unique holiday concept. The China Glaze® How Do You Live in Colour? Holiday Contest is open to residents of the United States as well as Canada (excluding Quebec), France, Mexico and the United Kingdom. China Glaze® nail lacquers are free of DBP, toluene, and added formaldehyde. China Glaze® nail lacquers are available through salons and professional beauty supply stores nationwide. For more information regarding the contest guidelines and Official Rules, please visit www.chinaglaze.com. Follow China Glaze on Facebook (@ChinaGlaze), Twitter (@ChinaGlazeOfficial), Pinterest (pinterest.com/chinaglaze) and Instagram (@ChinaGlazeOfficial & #ChinaGlazeHolidayContest2013).